Veterans week starts this Friday, on November 11th. And three of my favorite things are coming together at Arkansas Flag and Banner. I am thrilled to join forces with Annin Flag Makers and the American Red Cross to encourage Arkansas to send holiday wishes to active military and veterans. Drop by our showroom in downtown Little Rock and sign, or make, a card to show your love. When I first heard about this idea, a host of memories began to flood my mind. My favorite memory, and the one I decided to tell, was one of my father’s. After you read my inspirational, and short speech below you will again be reminded why the Red Cross is such a wonderful organization and why we love our military and why my Dad was called “The Greatest Generation”. Everybody has heard of the Red Cross and knows they collect and distribute blood exceptionally well. And that there name seems to be synonymous with disaster relieve. But they are more than that. Can you remember the first time you heard or learned about the Red Cross? Can you remember what you thought? My father was a prisoner of war during WWII. Shot down in Germany in 1944. He spent 2 years in Stollock 13. Yes, it was the same stollock number as Hogan’s Heroes, but it wasn’t like the TV show. Like so many war veterans, my father didn’t like to talk about the war. He didn’t want to think about the hard times and the people he killed, or the people he saw killed. But as time went by he healed and became proud of his service, the colorful war stories, and his purple heart. At the time of my father’s release from prison, he weighed 90 pounds. The Red Cross story was the first positive thing my father ever told me about the war. I believe there are many more Americans with similar stories of hope brought by the Red Cross. I hope you will all join the Red Cross in support of Veterans week by dropping Arkansas Flag and Banner and signing a card of appreciation. We love our Servicemen and women. Let’s show ‘em! Arkansas’ FlagandBanner.com, joins with Annin Flag Makers and the American Red Cross to encourage Arkansans to send holiday wishes to active military, their families, and veterans in our local communities. 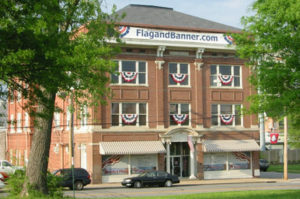 Arkansas’ FlagandBanner.com located on 800 West 9th Street in downtown Little Rock will host the event during Veteran’s Week Nov. 11 through Nov. 19. Visit the Holiday for Heroes table to sign premade cards for a service member or veteran for the holidays! Craft supplies will be available at the Card Making Station for the children or adults to use to make personalized cards. Holiday Mail for Heroes is an annual campaign by the American Red Cross and Arkansas’ FlagandBanner.com is honored to be part of this heartwarming program to spread a little holiday cheer to current and former armed forces and their families. Come into the FlagandBanner.com showroom to share your appreciation and support with an encouraging note for the holidays to the brave men and women who serve or have served our country. A simple card can have a profound impact in raising the morale of our deployed troops and our veterans here at home. The event kicks off at 8 a.m. Nov. 11th with refreshments (coffee, apple cider and desserts) being served all day while you shop, the normal 15% off military discount will be doubled during this week and available to all customers. Be sure to make or sign cards while in the store and perhaps even mingle and make friends with our local veterans and enlisted personnel who visit the store that day. This special event will continue until closing on Nov. 19th. The Little Rock Chapter of the American Red Cross will pick up the cards for delivery. Showroom hours are 8 a.m. – 5:30 p.m. M-F and 10 a.m. – 4 p.m. Saturdays. The showroom is closed on Sundays. Come make a card and show our Heroes how appreciated they are this holiday season!